Description: Print using the power of sunlight using an old photographic process called cyanotype! Simply prepare your absorbent surface (we'll be using fabric and paper) with a light-sensitive fluid, create your imagery, expose your prints in the sun, and develop them by rinsing them in water. This is a negative process, so areas covered by your imaegry - transparencies, lace, string, leaves, and small objects - will remain white, and uncovered areas will darken and turn blue as you wash and dry your print. You'll leave with fun, unique, fabulous blue prints along all the information you need to continue making prints on paper and fabric at home. And, as an added extra, Terri will demonstrate some ways to tone prints to achieve different color variations. Terri Dilling is a painter and printmaker inspired by the beauty and complexity of the natural world. She has a BA from Indiana University, a BFA from Georgia State University and has studied visual arts in England, Spain, and Italy. After a 2005 residency in South Africa, Terri revived printmaking in her own practice and helped found the Atlanta Printmakers Studio where she served on the Board for 12 years. Terri has received numerous grants and awards, and her art is in public and private collections around the world. 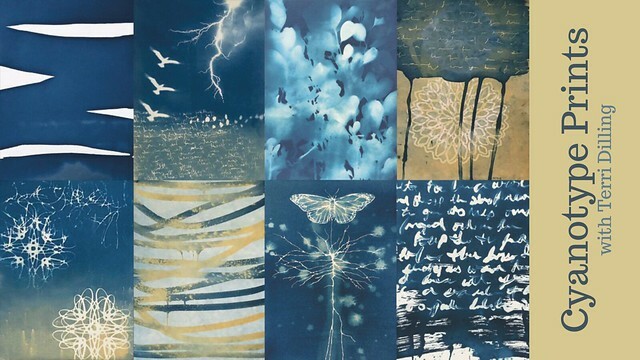 Recently, she was selected to exhibit her cyanotype "Diary" project for ArtFields 2019. Supply Fee: None. Cyanotype fluid, paper and fabric, and image toning supplies are all included in the class cost. If you have trouble registering or paying (Safari users!) or if you are concerned that this website does not have an https address, please use the following direct link for registration and payment: https://sefaa.secure.force.com/Programs/CnP_PaaS_EVT__ExternalRegistrationPage?event_id=a0u0V00000mUAmJQAW.